A golden eagle flies over a wind turbine on a Duke Energy wind farm in Converse County, Wyo., in April. WASHINGTON -- The government for the first time has enforced environmental laws protecting birds against wind energy facilities, winning a $1 million settlement Friday from a power company that pleaded guilty to killing 14 eagles and 149 other birds at two Wyoming wind farms. The Obama administration has championed pollution-free wind power and used the same law against oil companies and power companies for drowning and electrocuting birds. The case against Duke Energy Corp. and its renewable energy arm was the first prosecuted under the Migratory Bird Treaty Act against a wind energy company. "In this plea agreement, Duke Energy Renewables acknowledges that it constructed these wind projects in a manner it knew beforehand would likely result in avian deaths," Robert G. Dreher, acting assistant attorney general for the Justice Department's Environment and Natural Resources Division, said in a statement Friday. An investigation by The Associated Press in May revealed dozens of eagle deaths from wind energy facilities, including at Duke's Top of the World farm outside Casper, Wyo., the deadliest for eagles of 15 such facilities that Duke operates nationwide. The other wind farm included in the settlement is also in Converse County and is called Campbell Hill. All the deaths, which included golden eagles, hawks, blackbirds, wrens and sparrows, occurred from 2009 to 2013. The Charlotte, N.C.-based Duke has a market capitalization of nearly $50 billion. "We deeply regret the impacts of golden eagles at two of our wind facilities," said Greg Wolf, president of Duke Energy Renewables Inc. in a statement. "Our goal is to provide the benefits of wind energy in the most environmentally responsible way possible." A study in September by federal biologists found that wind turbines had killed at least 67 bald and golden eagles since 2008. Wyoming had the most eagle deaths. That did not include deaths at Altamont Pass, an area in northern California where wind farms kill an estimated 60 eagles a year. Until Friday's announcement, not a single wind energy company had been prosecuted for a death of an eagle or other protected bird — even though each death is a violation of federal law, unless a company has a federal permit. Not a single wind energy facility has obtained a permit. "Wind energy is not green if it is killing hundreds of thousands of birds," said George Fenwick, president of the American Bird Conservancy, which supports properly sited wind farms. "The unfortunate reality is that the flagrant violations of the law seen in this case are widespread." In 2009, Exxon Mobil pleaded guilty and paid $600,000 for killing 85 birds in five states. The BP oil company was fined $100 million for killing and harming migratory birds during the 2010 Gulf oil spill. And PacifiCorp, which operates coal plants, paid more than $10.5 million in 2009 for electrocuting 232 eagles along power lines and at its substations. The wind farms in Friday's settlement came on line before the Obama administration drafted voluntary guidelines encouraging wind energy companies to work with the Fish and Wildlife Service to avoid locations that would impact wildlife. Companies that choose to cooperate get rewarded, because prosecutors take it into consideration before pursuing prosecution. The company will also have to apply for an eagle take permit, and draft a plan to reduce eagle and bird deaths at its four wind farms in Wyoming. Duke's $1 million will be divided. The fine — $400,000 — will go into a wetlands conservation fund. The state of Wyoming gets $100,000. The remainder will be used to purchase land or easements to protect golden eagle habitat and for projects aimed at minimizing interactions between eagles and wind turbines in Wyoming. While the settlement with Duke is a first, there could be more enforcement. 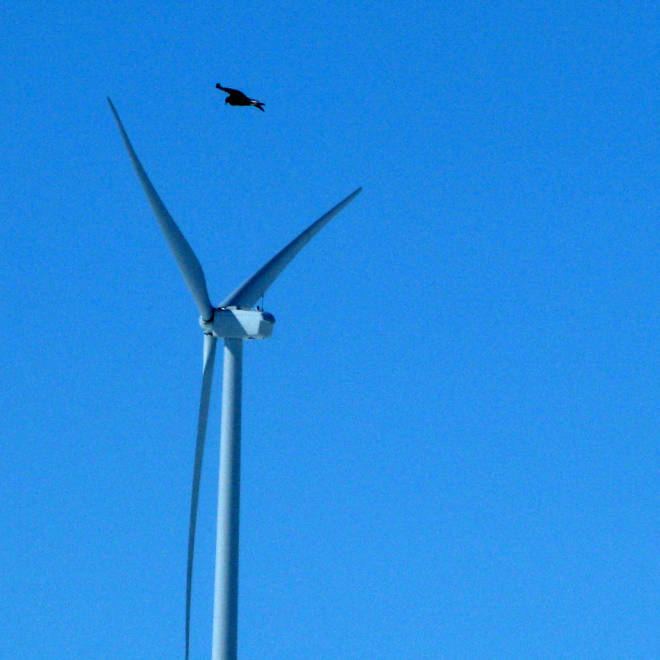 The Fish and Wildlife Service is investigating 18 bird-death cases involving wind-power facilities, and about a half dozen have been referred to the Justice Department. "No form of energy generation, or human activity for that matter, is completely free of impacts and wind energy is no exception," said the American Wind Energy Association in a statement, adding that air pollution-free wind power helps what experts say is the greatest threat to wildlife and their habitats — global warming.